Golden Touch Blackjack Revolution! by Frank Scoblete featuring the revolutionary and incredibly simple, yet powerful, Speed Count and the matching Optimum Basic Strategy (OBS). In minutes you can learn Speed Count and be able to play blackjack with an edge over the house. This new book includes a FREE CD so you can practice the Speed Count and OBS at home on your Windows computer. Click here to order the e-book!. Get the book instantly after ordering, as a digital PDF download, AND includes free training software! Looking to purchase our professional OBS strategy cards for Speed Count (Optimal Basic Strategy)? CLICK HERE. If you are an average blackjack player wishing you could get an edge at the game without all the hard work of learning how to count cards, we have something for you � something really easy. If you have tried card counting and found it too difficult, time consuming or impossible to master then we have something for you � something really easy. If you want to have fun when you play and not have to do the laborious job of keeping a traditional card counting system, then we have something for you too � something really easy. The Golden Touch Blackjack Revolution! by casino gambling #1 best-selling author Frank Scoblete is here! 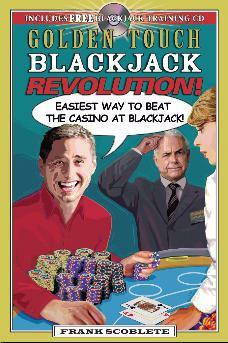 That�s right, the easiest advantage-play method ever created for blackjack is now available in our new book. Maybe you've heard of card counting at blackjack, or even tried it. Blackjack books all say how easy it is, and at first glance it might seem simple enough� just add numbers, subtract numbers, then divide numbers, and maybe multiply numbers, then keep track of the total. Then figure out how much you should bet. And then also memorize 18 to 200 or more changes to basic strategy according to the various counts. Then try not to have the casino bosses know you are counting cards and changing your strategy based on the count. Whew! That�s a lot of work! Suddenly what seemed so simple, gaining an edge at blackjack, wasn�t so simple after all! And as every professional card counter will tell you, it takes months of practice to learn even the simplest of valid card-counting systems and years to become a true expert. Sadly, many new "counters" make the critical mistake of using a system before they have perfected their skill at it. What happens to them? They crash and burn, often leaving the game with substantial losses and the thought, "It�s impossible to get the edge over the casinos by using card counting. It doesn�t work!" But blackjack players who can get a real edge over the casinos are really a rare breed owing to the difficulties mentioned above � the mental gymnastics you have to perform to keep an accurate count, convert that count by division and multiplication to determine your edge, then change your strategy according to the edge you now have. It�s difficult. It�s time consuming and it�s fraught with potential error. If traditional card counting at blackjack were easily learned from a book, the sales of blackjack books (which number in the millions) would have created hundreds of thousands of blackjack advantage players. The fact that those blackjack books have only been able to create such small numbers of expert blackjack players is proof positive that advantage-play at blackjack is quite difficult. Imagine a new method that's so simple that average players can learn it in a few hours and then play blackjack with the advantage over the casino. Imagine if you could learn this new method easily and apply it in the casino without the months and years of practice you would need for traditional card counting methods. The easiest advantage blackjack method ever developed and now available in print for the general public! Leant how to bet when you have the advantage over the house! Learn when to take insurance because the insurance bet now makes you money! Learn the best games to play and beat! Learn what games to avoid! Learn when to leave a game! Learn how much bankroll you need to play without fear! Learn about the 401G � for gambling! Learn to get all the comps you don�t deserve! Learn the power of inverse betting! Learn the power of uneven betting! And when you use the OBS and Speed Count you won�t appear to be like a traditional counter either! You don�t need to watch the cards as they are being dealt. There is no continuous addition, subtraction and division as in traditional card counting or difficult strategy changes based on the count. You will be playing like an average losing player even though you have the edge and win in the long run! The Golden Touch Blackjack Revolution! by Frank Scoblete is 182 pages and the retail price is just $24.95. Think of it, just $24.95 to learn a simple method that will give you a mathematically verifiable edge over the house for years to come; the easiest advantage method ever developed for blackjack. That�s not all: Learn from the CD too! Golden Touch Blackjack Revolution! comes with its own FREE CD that was created by Dan Pronovost, the creator of Speed Count and OBS, to help you practice Speed Count and OBS in the comfort of your house. Who should buy the new Golden Touch Blackjack Revolution! book and CD? You are a casino player who would like to learn the game of blackjack and learn a simple technique that will give you the edge. You are a blackjack player who has tried and failed to master card counting. You are a blackjack player who finds counting cards to be laborious and exhausting and are looking for an easier way to get the edge. You are a traditional basic strategy player who desires to become an advantage player, without spending countless months and years devoted to the learning process. You are a player who is looking for an easier system where the trap of counting errors doesn't erase your earnings potential. You are an advantage video poker or craps player (a controlled shooter) looking to add another advantage game to your arsenal. Check out the topics covered in the new Golden Touch Blackjack Revolution! � every skill you need to become a winning blackjack player is covered in this easy-to-read book. "A 12-year old can learn this in a couple of hours!" � Dominator, blackjack advantage player and co-author of Golden Touch Dice Control Revolution! "If you are looking to get a great edge with the easiest method ever devised for blackjack buy this book right now. You won�t be disappointed." � Dr. Henry Tamburin, blackjack expert, best-selling author, and publisher of BJ Insider Newsletter. "Speed Count is the easiest card counting system I have encountered." �Dr. Don Catlin, Professor Emeritus of Mathematics at University of Massachusetts. "Speed Count is appropriate for the basic strategy player who wishes to gain an advantage with less effort than conventional hi-low card counting." � Michael "Wizard of Odds" Shackleford. "For someone who plays a lot of blackjack but has never been able to get past basic strategy, Speed Count seems tailor-made." � John Grochowski, casino gambling author. "I learned Speed Count in two days and was able to easily use it in the casino. If you can learn basic strategy then you can learn Speed Count." � Bill Burton, casino gambling author and writer. Frank Scoblete has been an advantage blackjack player for over 20 years. He is the # 1 gaming writer in America today. He has written over 30 best-selling gambling books and tapes, appeared on dozens of television shows, and writes for over 40 magazines and newspapers. He also teaches Golden Touch advantage-play classes in blackjack and craps. He states, "The creation of Speed Count and the Optimum Basic Strategy is the greatest revolution in blackjack in the past 30 years. It�s easy to learn and fun to play and gives you the edge over the house. It doesn�t get better than that!"